La Cookaracha: It's Parmarama night!!! 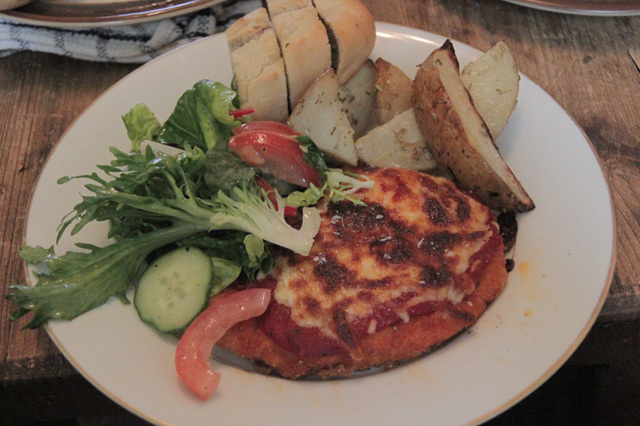 After a few requests for the recipe I thought it was time I shared with you my recipe for the good old Aussie Chicken Parmigiana. While still in London, Jake and I wanted to thank our friends Stina and Tony for letting us crash at their place. So we decided to make them a good Aussie dinner to remind them of home. You will need one tray of Flour, season this with salt and pepper. 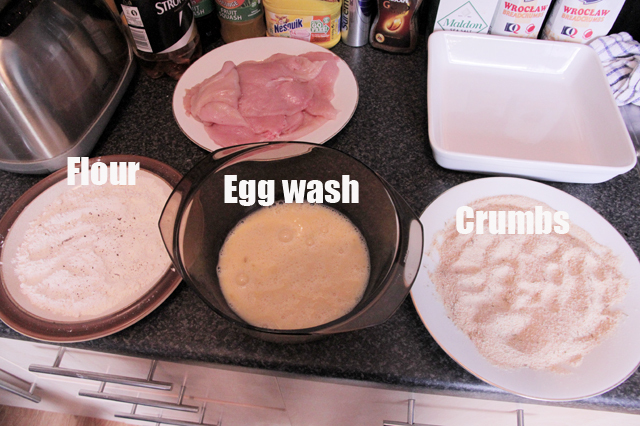 One bowl of egg wash, whisk up 2-3 eggs you can add a little milk to extend the mixture. One tray of bread crumbs, the store bought ones are fine, we used them here. Normally I would make my own bread crumbs using some stale bread. Panko bread crumbs are excellent to use. You can also flavour your crumbs with any herbs you like really. We used dried Rosemary, but I really like to use fresh chopped Thyme, use can also add grated parmesan cheese. 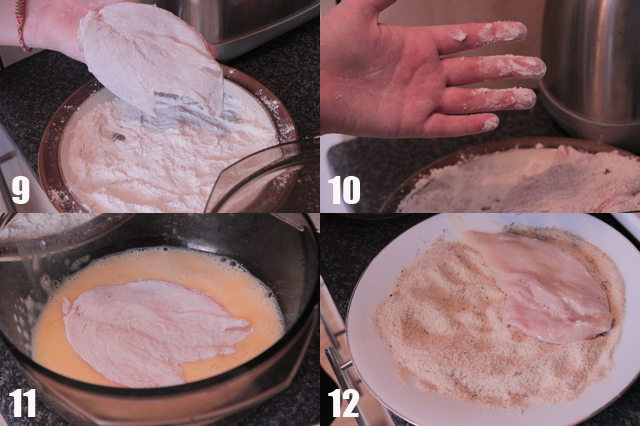 9) Place 1st chicken breast in the flour coating both sides, be sure to shake off the excess. 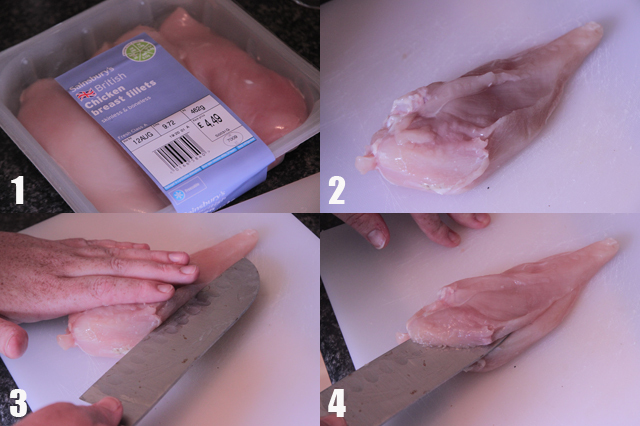 10) A handy tip for not getting sticky hands is to use one hand to handle the chicken in the dry ingredients and use your other hand for the egg wash part. 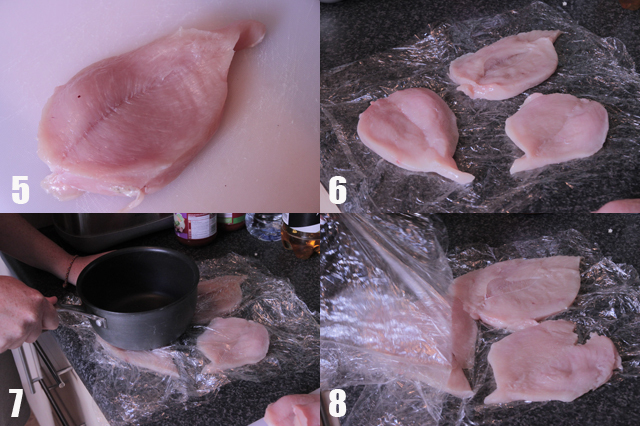 14) Once you have finished with the first chicken breast, place it onto a plate and repeat the process with the remaining breasts. You now have Schnitzels...the first step to your Parmas. 1-2) Heat up some canola or vegetable oil in a pan (these 2 oils have a higher smoking point and so are ideal for shallow frying) Drop a crumb into the oil, if it bubbles and brown the oil is ready. 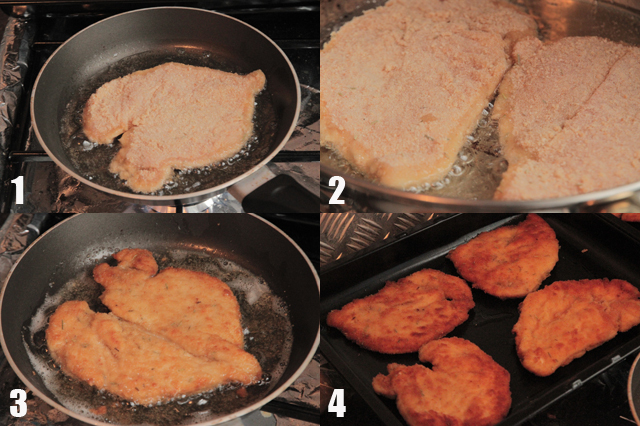 Gently place the Schnitzel into the oil, lowering it so it falls away from you so the hot oil doesn't splash back at you. 4) Take out your Schnitzels and place them in an oven proof tray. 7) Now top your Schnitzels with shredded cheese. I use 50% shredded tasty cheese and 50% shredded mozzarella cheese which I mix up in a bowl before topping. I think this is were a lot of people get this wrong. They either use all tasty cheese but then get not stretch in your cheese, or they use all mozzarella for stringy stretchy cheese but get not bite from the tasty cheese. 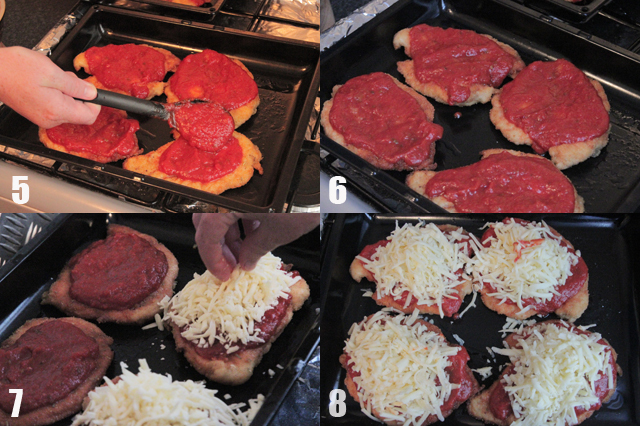 8) Be sure to top the cheese higher in the centre of the Schnitzel for when the cheese begins to melt as we cook them it will stay on the parma and not end up all over your oven tray. So here's how your Parmas should look when you bring them out from under the griller, and here are some yummy home made potato wedgies we made too.